The School of Arts and Humanities is reaching young musicians and digital design whizzes through its Community Arts Academy that begins Saturday, October 3. Weekend classes run for 10 weeks through December 12. The academy, founded in 2014, offers research-based instruction from Buffalo State faculty, alumni, and student interns with faculty supervision. Tuition ranges from $20 to $130. Young children and their caregivers spend 45 minutes on Saturday mornings experiencing the joys of music-making. The class for infants, birth to 18 months, is held from 10:30 to 11:15 a.m.; the class for toddlers, ages 18 to 36 months, is held from 9:30 to 10:15 a.m.; and the class for 3 and 4-year-olds is held from 11:30 a.m. to 12:15 p.m. in Rockwell Hall 107. Cost is $105. Register. 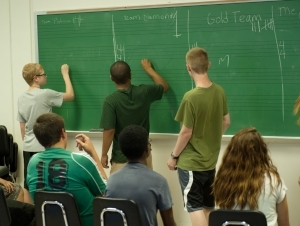 Students participate in ensembles, classes, and lessons in voice, traditional band and orchestral instruments, guitar, piano, African drumming, composition, improvisation, and music theory. Classes are held on Saturday from 10:00 a.m. to noon in Rockwell Hall 106. Cost is $20. Register. Students perform in small ensembles learning the fundamentals of jazz, including listening, performing, improvising, composing, arranging, and transcribing, on Sunday from 1:00 to 2:30 p.m. in Rockwell Hall 021. Cost is $105. Register. Students will learn the basics of digital imagery, animation, 3D modeling, and videogame level design. In addition to basic software training, students will learn about portfolio development and participation in discussions about creativity and design. No previous experience is necessary. Classes meet on Saturday from 9:00 to 11:00 a.m. in Upton Hall 211. Cost is $130. Register. Full payment is required at registration for all classes.